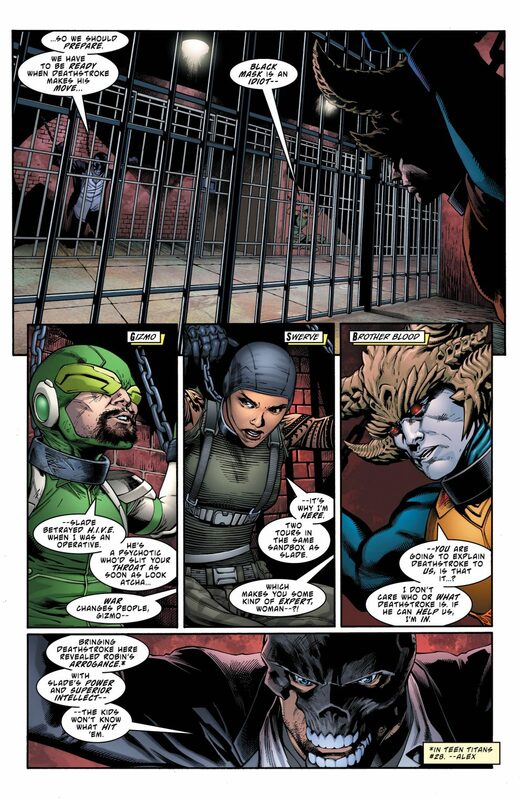 Slade Wilson and Damian Wayne have a long-running beef. After “The Judas Contract” and “Deathstroke vs Batman“, “The Terminus Agenda” is the third time that Robin and Deathstroke have crossed paths. 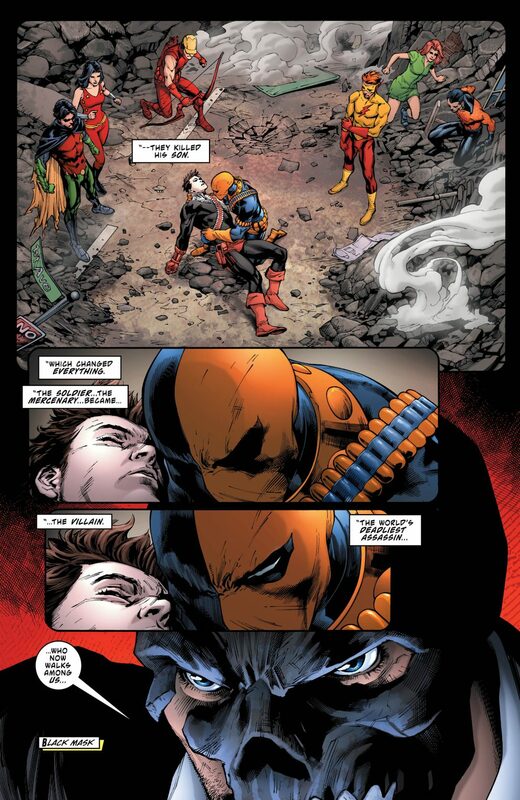 In “The Terminus Agenda” part one (Teen Titans #28), Robin decided that it was high time that he captured Deathstroke. So he convinced the Teen Titans to set up an ambush. 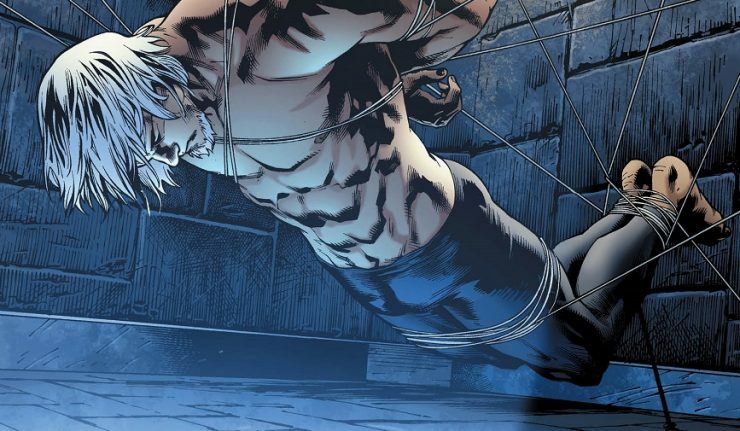 After apprehending the assassin at his local barbershop, Robin jailed Deathstroke in a secret prison located underneath Mercy Hall: the Titans’ base. Even though it’s only two issues into “The Terminus Agenda”, the story is already stalling. Teen Titans #28 was fantastic. The set up was interesting, and its cliffhanger was a pivotal moment for the series. 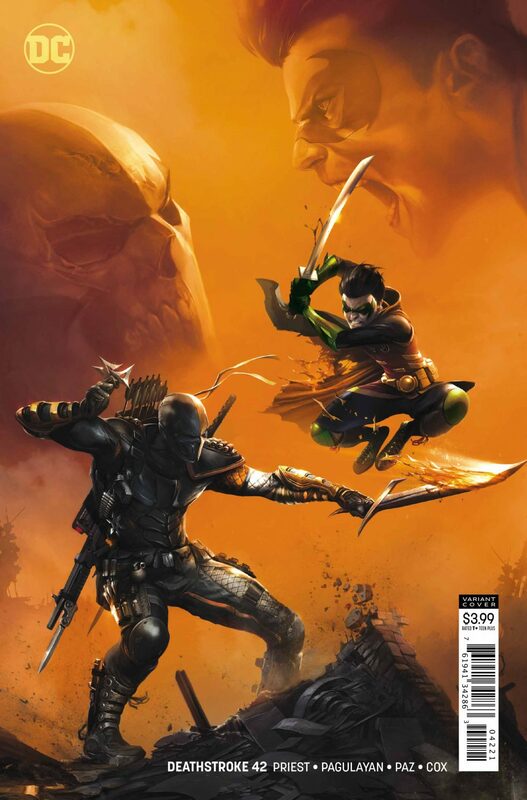 Unfortunately, Deathstroke #42 does little to push the main story forward. 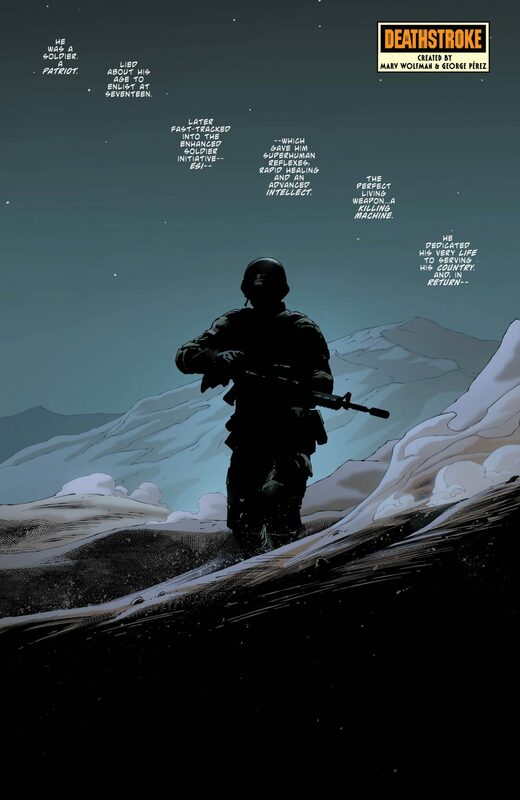 Little of the action actually involves Deathstroke, as half of the issue focuses on the Titan’s encounter with this random, third-tier villain called Blackrock. 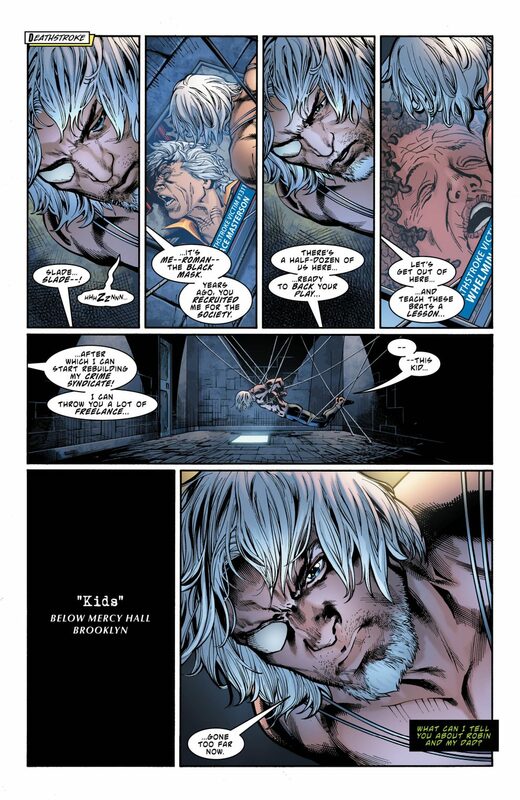 While this portion of the issue features Deathstroke’s running commentary on the Titan’s mission, the Titans are squarely center stage. 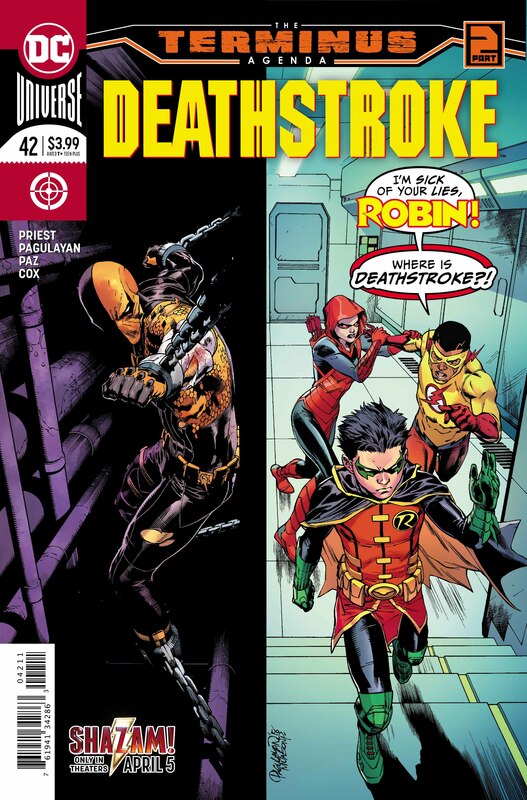 Essentially, this feels more like an average issue of Teen Titans that just happens to feature Deathstroke. While Deathstroke #42‘s script falls fairly flat, the pencils are exquisite. Carlos Pagulayan draws some brilliant action sequences. There’s a fantastic montage page that summarizes the relationship between Robin and Deathstroke. Instead of breaking each scene into different panels, Pagulayan’s layout moves from moment to moment on a field of chains. The composition is stunning. Another moment that stands out is Kid Flash’s encounter with Blackrock. 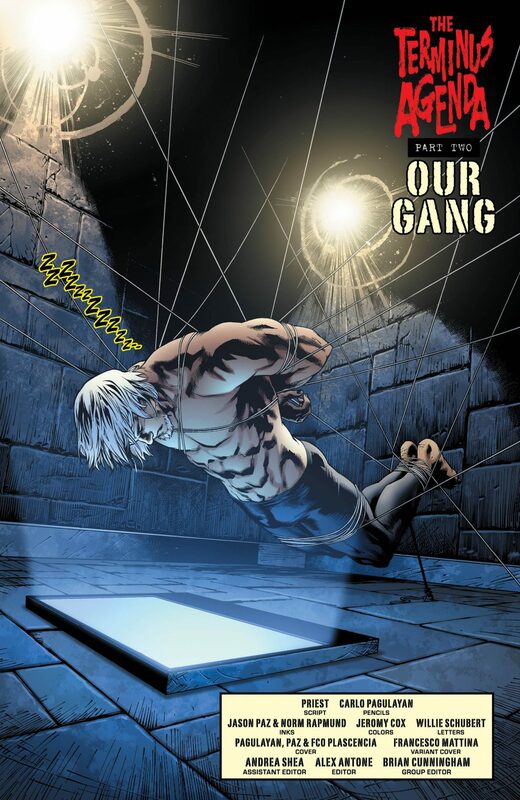 Pagulayan captures Wally’s speed, as he snatches a suicide bomb off the villain. The panelling shifts from a traditional grid to a more widescreen style that reinforces the brevity of the sequence. It works very well. “The Terminus Agenda” started strong but stumbled in its second issue. Pagulayan’s beautiful pencils are burdened with a script heavy story that feels forced. 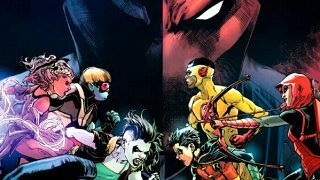 The dynamic between the Titans and Slade is interesting, but little is unpacked in this blip of an issue. Hopefully, Deathstroke #42 will become more important as the crossover continues, but as for now, this issue comes across as aimless. 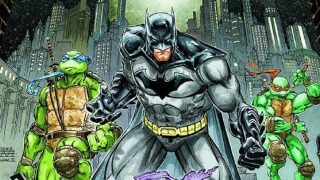 Verdict: read this one only if you are already invested in the crossover.